My final ceremony in the Amazon was not with Ayahuasca, but with the ancient medicine of the Chavin culture of the northeastern mountains and coastal areas of Peru. Huachuma is the most common local name for the plant whose post-colonial name is the San Pedro cactus. As both cacti contain mescaline, Huachuma can be considered South America’s parallel, if decidedly not equivalent, to North America’s peyote. Just as with peyote, this cactus has been used for thousands of years to bring humans into a powerful spiritual dimensional experience for healing and for enlightenment. The ritual and ceremonial forms associated with Huachuma are based on the mesa, a literal table or layout of ceremonial power objects in the form of a cross. Much of this has been co-opted by the Catholic church and most “San Pedro Mesa” ceremonies are very syncretic and include objects, references, and appeals to Jesus, Mary, the saints, etc. My interest was to find the older, more authentic, pre-Columbian version of the cactus ceremonies, representing true ancient shamanism. In today’s Amazonian or Andean cultures, this is not easily found, but Howard Lawler is, surely, the best source for this kind of experience. He has been restoring this ancient style and level of Huachuma ritual for decades, and has been able to attain and establish a truly non-syncretic and very powerful mesa ceremony. His Huachuma Mesada Pilgrimages are intense, nearly two-week long expeditions to the ancient sacred sites in northeastern Peru to engage with the plant in the way and in the very places that the ancients did. He also offers an introductory mesa ceremony in the Amazon for those, like myself, who are there to work with Ayahuasca but also wish to have an initiation into Huachuma. This actually makes a lot of sense, as Huachuma began in the Amazon with the concept of the water mesada. Yacumama is the serpent spirit that represents water and the essence of life springing from the great Amazon. He is pictured as a serpent and as the serpentine river that winds through the great forest of life, enlivening all the inhabitants from plants, to animals and us. Water is the essential ingredient for life. In Ayahuasca rituals, one works with Pachamama, the great female spirit of the plants and animals – this is Mother Ayahuasca, the “mother earth” spirit who engages, teaches, and heals within the context of the Ayahuasca medicina. When working with Huachuma, one encounters a complementary male spirit, a Grandfather Huachuma. He is expressed in the Amazonian ritual in the form of Yacumama, the essence of water. The ritual begins at the great mesa that don Howard has created inside the ceremonial molucca at the sanctuary. This large layout begins with the lower world, then the crossbar mesa representing the middle world (our everyday dimension), and the mesa at the top representing the upper worlds. There is also a lancon or stone stela like the one at the great temple of the Jaguar. This stands at the cross point and represents the “axis mundi” or the world axis. It leads up into the heavenly realms as well as down into the unconscious worlds. The mesa is a three-dimensional map to a multi-dimensional universe. Huachuma cactus is reduced to a liquid that is intensely bitter, but is not disgusting or nauseating as Ayahuasca is. Also, there are no dietary restrictions with Huachuma as there is in Ayahuasca. One drinks the liquid and is offered an immediate chaser of limonade – a tart and non-sweet lemonade that really helps to offset the bitterness and slight discomfort of drinking the medicine. This will be offered at various times throughout the length of the ceremony, which can take eight hours or so. Unlike Ayahuasca, this does not occur at night with darkness and the singing of icaros. Huachuma is an animating and animist agent and it is useful to take it during daylight and, in the initial stages, get out into nature to see and experience it. We took the medicine at about two in the afternoon and after the initial rituals, immediately got into the boat for a trip some miles upriver to a tiny settlement. We pulled into the bank and walked along a long covered wooden walkway to get to the village. A few locals came out to see us and some of the kids played in the river or with a soccer ball while one boy presented a monkey for us to see. As this is happening, I was coming alive with the energy of the Huachuma medicine. A gentle rain began to fall, and the individual drops were superimposed over the verdant green fields surrounding the settlement. 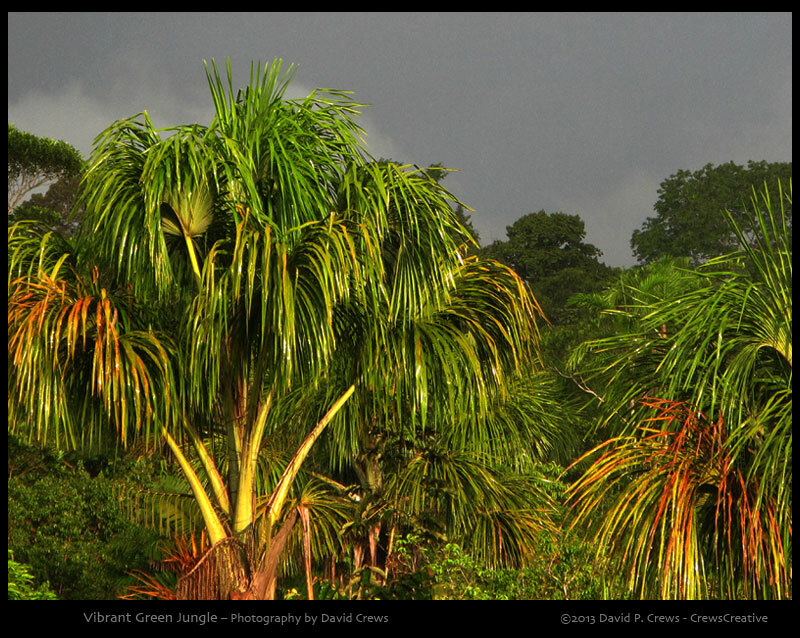 Each drop vibrated like electric diamonds and the greens beyond seemed to glow with life and energy. This is a very active medicine that, in this initial phase, engages us in a physical and super-awake mode that leads to a strong sense of joy and happiness. Everything is alive! This is what animism feels like! As we returned to our boat, I settled in and took a fresh apple to eat. It’s flavor was enhanced in the same energetic manner as the objects I saw. It was delicious! A truly wonderful sunset glowed in orange and red like an open kiln under the rain clouds that began to gather. As we motored back down the Rio Momón, that rain began to fall in earnest – a true tropical downpour. This was no ordinary rain, with or without our enhanced senses. It rained in sheets until the boat was literally encased in a tube of water. Water below the hull, water rushing the canvas above our heads as if we were under a huge waterfall, and not rain streaks, but walls of solid water on all sides of the open-sided boat. The pilot had to slow to a crawl and use his searchlights to make our way safely back to the sanctuary. Howard said that in his quarter century of living here, it was the hardest rain event he had been in on the water. Rather than feel in danger during this huge rain, I and the others felt safe, curious, and engaged. It was obvious to us that we had truly invoked Yacumama – the Water Spirit – and he had manifested for us in a very big way. With a safe return to the ceremonial molucca, and with darkness upon us, the next phases of the medicine began. In the presence of the mesa, we entered into a more internal space where introspection and visioning can happen. This lasts until about ten o’clock when the medicine begins to dissipate and we retreat to the dining hall for a good meal. This was the first meal in about two and a half weeks for me that had any salt in it. We had some bits of chicken that were fried with some salt, and they were truly delicious after the long diet and having just been sensitized with the Huachuma. I feel like I have internalized much of the work I did with Huachuma and will be processing it in my life for a while to come, just as with the work with Ayahuasca. I was unable to continue on with Maestro Howard on his Mesada Pilgrimage this time, but hope and intend to do so next year. These ceremonies: five Ayahuasca, one Bobinsana, and one Huachuma over two and a half weeks, is enough for me for now. I am very happy to have had the opportunity, however, to work with Huachuma this time and experience the great Chavin Mesa and the power of this level and style of shamanism, based as it is on the very work that our ancestors were engaged in over three thousand years ago. San Pedro ceremonies are rather common in the Andes and are generally not nearly as powerful in terms of the actual medicine used. They also blend in all the syncretic religious elements that tint the experience and give it a shape that does not originate with the plant and its spirits. I feel very fortunate to have encountered Howard’s mesa, an authentic, pre-Columbian shamanism that resonates with the power and energy of the great Spirits. For those of you who may have anticipated an update before now, I appreciate your patience. I decided to wait until I returned home to write my final journal entries for my trip to the Amazon. After the third Ayahuasca ceremony, my work there became more intense and involving, plus the internet connections on-site were less than ideal for posting to the internet. I have safely made my way back to my home in Texas after a final week taking an initial look around Panama. Now, I can begin to catch up on these posts and eventually get some of my many photos and audio recordings posted as well. Please stay tuned! The final two Ayahuasca sessions were more intense and physical than the previous three. As I somewhat anticipated after the first three ceremonies, the visions aspect of my work here was to be limited, but powerful in the end. It seemed I was to deal mostly with physical cleansing, healing, and insights, which I hope to carry forward into my everyday life. The fourth ceremony was especially physical in that I reacted with a hard sweat all night long. This is uncomfortable, if not concerning, and it really focuses one on the state of the body throughout the session. This hard-sweat ceremony happened to me once before, so I was aware that it might be a possibility this cycle. My final, fifth ceremony was completely clear of the sweats and other discomforts, and this round of Ayahuasca did let me experience a powerful kind of vision. I won’t actually describe this in detail as it was quite personal and had to do with my own inner emotional state and body state after some recent surgery for cancer. I will say that in essence, it allowed me to experience a kind of complete healing and merging with the universe in a way that I feel is the actual state of being that is obscured by our material lives and bodies. I was made to feel completely loved and welcomed into an embrace of unity with the spirits that watch and love us. Understand that this is my interpretation of the shamanic experience I had, and not a claim for others to believe or reject. While common themes do occur and overarching interpretations can be implied, shamanism, especially of this kind and intensity, is only interpretable by the individuals who partake of the experience, and then only for themselves. There are no priests in shamanism. Five Ayahuasca ceremonies. When done authentically in the proper set and setting and with properly prepared medicine, this is a massive set of experiences and represents the most that anyone should attempt in one cycle of work. Maestro Howard said that to do more would be like pouring water into a cup already brimming full. The experiences would just spill over and be lost along with their personal value to the participant. With the strict diet and these five intense ceremonies over about two weeks time, I was feeling very stretched and yet full indeed, and I was pleased and ready for it to come to its conclusion. Some of my wonderful fellow participants headed home after this, and a few stayed with me at the sanctuary to engage in a different kind of plant teacher medicine: Huachuma. This is the great medicine of the ancient Chavin culture of Peru and I will describe that ceremony in my next post.